Secondary malignancies are an unfortunate and often fatal reality of therapies for a variety of cancers. Even patients who have seemingly been successfully treated can develop a fatal form of leukemia, sometimes years later—a clinical scenario known as therapy-related myeloid neoplasms (t-MNs). While risk factors for the development of t-MNs are currently not well understood, a new study conducted by researchers at The University of Texas MD Anderson Cancer Center has revealed that preleukemic mutations, called clonal hematopoiesis, may predict whether patients develop the aggressive condition. The ability to detect t-MNs earlier is critical, given that the disease usually occurs 3 to 8 years following the completion of chemotherapy and/or radiation therapy. The investigators studied 14 patients with t-MNs and found traces of preleukemic mutations or clonal hematopoiesis in 10. To determine if preleukemic mutations could reliably predict whether the patients would develop leukemia, the researchers compared the prevalence of preleukemic mutations in the 14 patients with 54 patients who did not develop t-MNs after therapy. In the sample of 14 patients with t-MNs, the team looked at samples of bone marrow at the time of t-MNs development and blood samples obtained at the time of their primary cancer diagnosis. 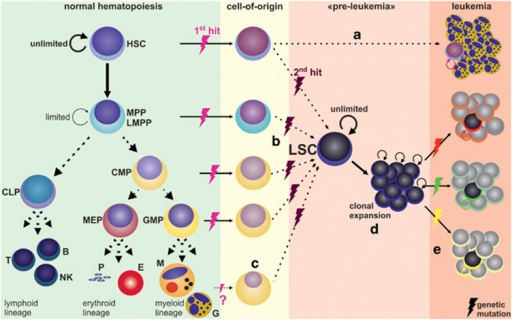 Through rigorous statistical analysis models on the external cohort, the researchers found that the presence of clonal hematopoiesis significantly increased the risk of therapy-related myeloid neoplasm development.